Is sugar the demon it’s being made out to be, and are certain forms of sugar healthier than others? These are really good questions and there’s a LOT of confusing information out there. It’s good to know, before we talk about anything else, how much sugar we should be consuming overall. For the purposes of this article, I’m going to focus specifically on ADDED sugar. We eat A LOT of sugar in the US. Many of us are getting around 22 teaspoons a day! Current Food and Drug Administration (FDA) recommendations are for no more than 10% of calories to be from sugar. Say you’re a 40 year old woman, 5 foot 5 inches tall, who weighs 140 pounds, and gets 30 minutes of moderate intensity activity 3-5 days per week. You’ll maintain your weight consuming about 2000 calories a day. That would mean you should limit your sugar intake to 200 calories, or 12 teaspoons. That’s equivalent to 48 grams – the measurement seen on food packaging. That’s not much, but the World Health Organization (WHO) is more strict, suggesting just about half as much – 6 teaspoons, or 25 grams. Some yogurts have that much in one single serving! It can be difficult to parse out what is ADDED sugar, and what is naturally occurring. Thankfully, we have pretty good nutrition labels, and they’re only going to be getting better. By mid-2018, added sugars will be clearly separated on the food label as their own line item, with total grams listed. Until then, you’ll need to read the ingredient list to find out of your intended item has added sugars, and you’ll have to guess how much it might be. Unfortunately, it’s not always as simple as just looking for the word “sugar” though it’s a good start. You might see coconut, beet, cane, and even brown sugar. Those are pretty easy to spot. Here are nearly 30 other names that sugar goes by and sneaks into the products we eat: sucrose, corn syrup, high-fructose corn syrup, corn syrup solids, agave nectar or agave syrup, molasses, cane juice crystals, evaporated cane juice, fruit juice, fruit juice concentrate, honey, maple syrup, sucanat, barley malt, brown rice syrup, dextrin, dextrose, ethyl maltol, glucose, lactose, malt syrup, maltodextrin, maltose, rice syrup, crystalline fructose, fructose, D-ribose, galactose. Time to get back to the original question. Are any of those sugars better, or at least less bad, than others? The short answer is no, not really. Sugar is sugar and the most important takeaway is that we really need to focus on limiting our consumption of added sugars, in all forms. However, for my science-y friends, here’s a bit more info. 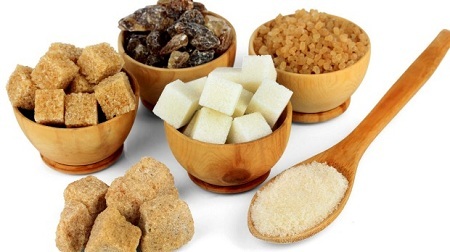 “Sugar,” depending on type, is mostly a mixture of the molecules glucose, sucrose and fructose (less common are lactose, maltose and galactose). Glucose can be metabolized by nearly every cell in the body, but fructose is metabolized nearly entirely in the liver. That’s where all the hullabaloo about high-fructose sweeteners came from. Some studies have shown that higher consumption of fructose can result in increased incidences of insulin resistance, metabolic syndrome, fatty liver and type-2 diabetes. Table sugar is 50% glucose and 50% fructose. High fructose corn syrup is usually 55% fructose and 45% glucose but can be as high as 90% fructose and 10% glucose. Just a handful of years ago agave syrup was touted as a healthy sweetener, but it’s actually 70-90% fructose and 10-30% glucose, so it’s really not a healthier choice after all. References here, here, here and here.